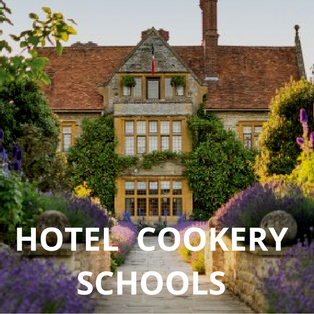 We’ve selected the best places to stay in Somerset, including luxury hotels, boutique hotels, budget hotels and pubs with rooms. With rates provided by our Booking Partners, it’s easy to check availability and book. A funky, fun and oh so contemporary pub with rooms at the foot of the Mendip hills. Located between Bath and Bristol, the Litton has been given a stylish and playful makeover. There are 12 boutique bedrooms, each one individually designed and named after the surrounding medieval fields and waterways. Watery Coombe has a comfy Hypnos bed, a roll top bath and overlooks the courtyard and gardens. Friendly and professional staff, sublime food and a beautiful setting make this a great getaway destination. Rooms from £120 a night. If you’re looking for a relaxing weekend break in Somerset or a pit stop en route to Cornwall, The Swan in Wedmore is a good place to stay. The country pub dates back to the 1700s and has everything you need for a short break– great rooms, a warm and friendly atmosphere, a cosy bar with woodburner, and top notch food. Chef, Tom Blake, used to work at River Cottage, so the food is full of flavour. Try the Gloucester Old Spot pork belly served with bubble and squeak. Wedmore village is picturesque with handsome Georgian houses, quirky shops, two pubs and an Indian restaurant. For things to do nearby, take your pick from countryside walks, Cheddar Gorge, Wells Cathedral and Bath. Book room 3 at the front of the pub and you’ll have a freestanding bath in your room. Rooms from £85 a night. One of the best places to stay near Cheddar gorge. Cavers and walkers flock to The Bath Arms because it’s just a short walk from the hotel down to Cheddar’s famous gorge and the caves. The handsome listed building is full of character. There are six simply but tastefully furnished rooms. Each one is spotlessly clean and comes with small touches including a generous welcome tray with nibbles. With its 6ft bed, the Kingfisher room is particularly comfortable. In the restaurant, delicious food and generous portions. After a hearty walk, relax with a Ploughman’s and a pint of local Thatcher’s cider. And, if you’re looking for a convenient place to stay near Bristol airport, The Bath Arms is a mere 15-minute drive away. Rooms from £95 a night. We love the Brooks collection of boutique style guest houses. You’ll find one in Bath but also in Bristol, Edinburgh and Herefordshire. If you like stylish and contemporary touches at an affordable price, Brooks Guest House is one of the best places to stay in Bath. With 22 rooms, (including family rooms), and a location that’s just a 10-minute walk into Bath city centre, it’s a great choice. A boutique townhouse hotel in the centre of Georgian Bath.You’ll find elegance, comfort and a little luxury at The Queensberry hotel. Modern design cleverly complements the building’s historic architecture. Expect period features, passageways and beautifully decorated bedrooms. Nearby are the Bath Assembly Rooms and a short walk down the hill leads you to the city’s best shops and cafes. With its award-winning restaurant, it’s one of the best places to stay in Bath for a gourmet weekend break. A warm and welcoming inn with rooms situated in the quaint Somerset village of Long Sutton. The location of the Devonshire Arms is picture perfect as it overlooks the church and the village green. Once a former hunting lodge, this is a charming and comfortable place to stay if you’re visiting the Somerset levels. The interiors are fresh, contemporary and effortlessly stylish. There’s a wood panelled restaurant, cosy open fires for relaxing with a glass of Somerset Cider brandy and pretty outdoor spaces for al fresco drinks. The nine bedrooms are smart with big padded headboards, crisp white sheets and en-suite bathrooms. Bring your bike with you and cycle through Somerset’s apple orchards on the cider cycle trail. Backwell House is a little gem in the Bristol countryside. This fine Georgian manor house is an elegant boutique hotel with nine bedrooms. You’ll feel like you’re staying in a private house. Fittingly, each bedroom is named after the previous owners of the house. They’re very smart and tastefully decorated and come with either garden or countryside views. Amazing bathrooms, big comfy beds and crisp bed linen provide the luxury feel. The hotel is conveniently located just 3 miles from Bristol airport so it’s perfect for an overnighter before heading off on holiday. Weekenders can enjoy exploring North Somerset. Perhaps lunch at The Ethicurean restaurant at Barley Wood Walled Garden in Wrington followed by a visit to Thatchers Cider Farm in Sandford. You’ll feel like you’ve stepped into the pages of a glossy interiors magazine at Wellies. This is no ordinary country B&B. It’s gorgeous and stylish. Outside, a lovely old vicarage with pretty gardens located next to the village church. Inside, four stunning and beautifully appointed bedrooms. The Portman room comes with a freestanding copper bath perfect for a post-walk soak. Wellies is a delightful and peaceful place to stay in the Somerset countryside. It’s close to Taunton, the Somerset railway and is an hour’s drive from Bristol. Stop off here en-route to Cornwall and you won’t want to leave. It’s pooch-friendly, too. Rooms from £115 a night. 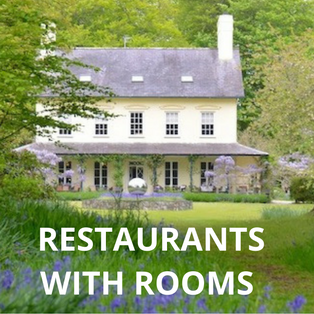 Enjoy outstanding dining in Exmoor at this top sporting hotel. 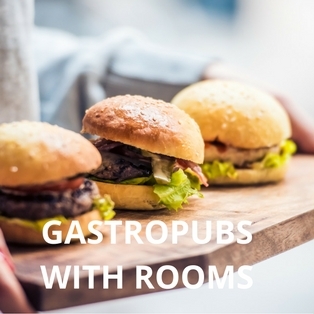 The Tarr Farm Inn is one of the best places to stay in Somerset for top gastro pub food. The area is known for its world-class partridge and pheasant shooting so game features on the menu. Stay in one of the 9 traditionally furnished rooms. The peaceful setting offers stunning countryside and views of the river and Tarr Steps. It’s the perfect weekend getaway especially if you love walking. Dogs are very welcome to stay and are provided with beds, towels, bowls and biscuits. Rooms from £150 a night. Stay in one of England’s prettiest medieval villages, set within Exmoor National Park. The Luttrell Arms resides in the charming and popular tourist village of Dunster on the North Somerset coast. This historic coaching inn dates back to the 15th century and is full of character and period features. The bar is particularly atmospheric with its beamed ceiling and huge ancient fireplace. Relax with a pint of Otter Ale and tuck in to tasty bar food including fish and chips. There are 28 individually designed bedrooms of varying sizes. Go the whole hog by booking into one of the four feature rooms that come with four-poster beds and extra historical accents. Bring your dog with you and go yomping on Exmoor or for long walks along the South West coastal path. Rooms from £65 a night. An oasis of calm in an area of outstanding natural beauty. Cross Lane House is a charming small hotel (or at weekends, a restaurant with rooms). The hotel has four attractive boutique bedrooms. A late medieval property, it is full of character and beautifully furnished throughout. The hosts have thought of everything – from plenty of books and magazines for a relaxing read, to homemade goodies and local produce at breakfast. Start your day with a morning Nespresso and your evening in the snug bar with a glass of wine. As for the location, it’s ideal for exploring places such as Dunster and for going on long walks on Exmoor. This is the sort of hotel that will make you want plan another staycation as soon as you leave. Rooms from £165 a night. A West Country retreat that straddles the boundary between Somerset and Dorset. It’s the quality of the food that draws visitors to The White Post at Rimpton. Stay at this award-winning restaurant with rooms and your taste buds are in for a treat. With the emphasis firmly on local and seasonal, expect inventive dishes from chef, Brett Sutton. Tuck in to Sunday lunch, with its choice of five different meats, surrounded by soothing views of the countryside all around. Nearby, the charming town of Sherbourne with its independent shops, cafes and castle.